Mod is a kind of additional file to change contents in Euro Truck Simulator 2 (ETS2) Games, such as Vehicles, Roads, Areas, Traffic, and so on. 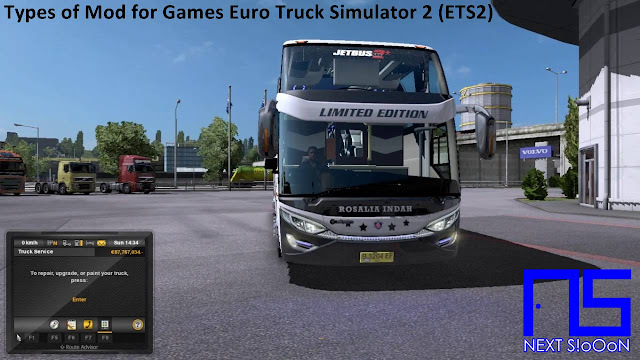 So the game will never be boring, because if you are bored, you can try to install the Mod on the ETS2 Game to change the contents of the Game so that it is like New. Suppose you can play the Basic version of ETS2 Game, you can try adding a Map with a variety of vehicles. So the game content is different from the previous version. Euro Truck Simulator 2 (ETS2) is an Open-Source Game that gives everyone the freedom to change or add content to the ETS2 Game. Today there are many people who make Mod (Modder) and share it on the Internet. How to install the Mod is also quite easy, the difficult thing is to adjust the Mod with the ETS2 version, you have to install the appropriate Mod (Compatible) with the version on the ETS2 Game. If it doesn't match, then the possibility of the game will be Crash / Error. Many people are not satisfied with the appearance or gameplay of ETS2 because it is less realistic. The modder makes the Mod, known as Real Graphic, useful for making ETS2 games more real, from vehicles, roads, sunshine, rain, to the whole game. With Real Graphic you will see the ETS2 Game with real gameplay. The scenery while in the countryside will look more real and real, other vehicles that pass, until the weather like rain will feel more real. This Mod file contains a Map or Route added to the ETS2 Game, so that the Map on ETS2 is different. Suppose there is a Tokyo Map containing several regions in Tokyo City, those of you who reside in Tokyo will find it fun to play the ETS2 Game with Tokyo Map because they will see various regions, buildings, buildings, places in Tokyo. Usually Mod Map is made according to the original, that makes ETS2 Game very exciting to play. There are many Mod Modes available starting from regions in Europe, America, Africa, to Asia. ETS2 is indeed a Game 100% Open Source, even though by default this Game is a Truck Simulator, but you can add Bus Vehicles to the Game. Driving Bus is equipped with Passenger Mod, you can deliver passengers to the Destination Terminal. There are many types of buses that you can install, starting from the small bus (Minibus) to the big bus with Double-Deck (Bus Level). This mod is used as an addition so that the game is not boring, if in the ETS2 Game Default you will see a Highway that is not too crowded and there are only a few vehicles. With Mod Traffic you can add a busy highway, there are vehicles, trucks, there are motorbikes on the road, and so on. With Mod Traffic the game will feel more crowded than before that does not use Mod Traffic. With this Mod you can add various types of vehicles to the game, one of which is to add a car to the game. A variety of cars ranging from Classic to Newest cars (Sports Cars) are available. Some of the favorite car mods are Lamborghini Mod, Ferrarri Mod, BMW Mod, Volkswagen Mod, and various other cars. The game is even more exciting with the addition of sports car vehicles in the game. Useful for adding Accessories to Truck or Bus vehicles on the ETS2 Game, with this the Truck is getting better. Some accessories such as lights, car body, Caravan, stickers or Gravity on the vehicle. With additional accessories will make the vehicle more interesting to use because it looks cooler. Those are some of the most used and most common Mods sought by Euro Truck Simulator 2 Game players (ETS2). Hopefully useful, thank you for visiting Next-Siooon (NS). Keyword: Types of Mod Types for Euro Truck Simulator 2 Games (ETS2), Guide to Install, Information on Types of Mod Types for Euro Truck Simulator 2 Games (ETS2), Types of Mod Types for Euro Truck Simulator 2 Games (ETS2), Types of Mod Types for Euro Truck Simulator 2 Games (ETS2), Install, Game and Software on Laptop PCs, Types of Mod Types for Euro Truck Simulator 2 Games (ETS2) Games and Software on Laptop PCs, Guide to Installing Games and Software on Laptop PCs, Complete Information Types of Mod Types for Euro Truck Simulator 2 Games (ETS2) Games and Software on Laptop PCs, Types of Mod Types for Euro Truck Simulator 2 Games (ETS2) Games and Software on Laptop PCs, Complete Guide on Types of Mod Types for Euro Truck Simulator 2 Games (ETS2) Games and Software on Laptop PCs, Install File Application Autorun Exe, Tutorial Types of Mod Types for Euro Truck Simulator 2 Games (ETS2) Autorun Exe Application, Information on Types of Mod Types for Euro Truck Simulator 2 Games (ETS2) File Application Autorun Exe, Pandua Tutorial Types of Mod Types for Euro Truck Simulator 2 Games (ETS2) Autorun Exe File Application, Types of Mod Types for Euro Truck Simulator 2 Games (ETS2) Autorun Exe File Application, Types of Mod Types for Euro Truck Simulator 2 Games (ETS2) Autorun Exe File Application with Pictures.